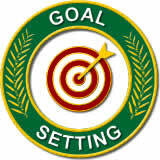 Goal Setting 101- How do you do it? Goal setting. Do the words send shivers down your spine, or do they make you want to dig out your day planner and your prettiest pen, and dig in? I’ve studied goal setting under the Franklin Planner people; I’ve been a devotee for over twenty years of their system. I’ve learned goal setting (and mission planning) from Bob Mayer. I’ve done a five main goals for five years, completely under Debbie Macomber’s spell, during an RWA National Conference Keynote Luncheon. And yet, I’m still figuring out how goal setting and I get along. I know that a big mission is propped up with smaller tasks that must get done in order for the big mission to be successful. In other words, “life chunks” – those big rock goals – should be put into your life bucket first, so the smaller goals – those pebbles, the sand – can fit into and around the bigger goals. And your bucket still has room for water (lesser goals). But I’m looking for more. I’m looking for your opinions. How do you set goals? How often do you review them? Do you have daily, weekly, monthly goals? A one year plan, five year plan, ten years? Career goals, personal goals, fitness goals? Do you separate out your goals (financial, fitness, career, house), or are they all a part of a master plan? I’d love to know. Please leave a comment and tell me how you work your goals list. The comments will be open all week – and at the end of the week I’ll pick one lucky commenter to receive a $10 Amazon card as a thank you! This entry was posted in Life and tagged Amazon, Caine Brothers, Christine Ashworth, Debbie Macomber, Franklin Covey, giveaway, goal setting, RWA National Conference. Bookmark the permalink. 14 Responses to Goal Setting 101- How do you do it? Great question, Christine. I love goal setting! In my world, goals are flexible, measurable, and are like a personal assistant to keep me on track. Starting with the macrocosm, I do have broad, three, five, and ten year goals–a general vision of where I see myself heading over time. That said, God always seems to have bigger plans for me than I have for myself, LOL. On a smaller scale, I set yearly goals in Jan. And check in quarterly to see how I’m doing and if they need adjusting. I have a calendar with monthly and weekly tasks to keep me on point, but the real work is in the daily and weekly to do list that moves me forward step by step. The actual goals for my writing life require much more attention and micromanagement than my general life goals which are a part of everyday life for me. Things like working out, making time for fun, and trying to stay balanced are always in my head. I think folks who have trouble with setting goals have a hard time figuring out exactly what they want. If you know that, getting there is just one goal after the other. PJ, I like the broad, overarching goals. I need to do that again – it’s been a while. Thanks for dropping by! I’m also a member of Jenny Crusie’s Forums and we have a category titled monthly goals and submissions. We post there and do the rah rah, or commiserate on rejections, etc. In my opinion, I think it doesn’t matter where you record goals it just matters that you have a plan. Roben, I like the monthly goals idea. That’s marvelous! You are going to have to share your methods with me. I don’t seem to have any goals – only I do, but they are on vision boards. For whatever reason that works better for me. This reminds me that it is time for a new one. I just don’t work well with linear goals. Visual stimulation works better for me. Vision boards are a great way to keep your goals in sight. Do you put dates beside the visual cues, Maria? Sam, you are too funny! Often I write my goals on a calendar – and then never look at that calendar again. I’m trying to really wrap my head around goal-setting! Goal setting, what a great post! I am just now considering making goals every first of the month. I write a daily list (that often turns out to be a weekly list of goals LOL) and of course the New Year is a great time to goal set, but I’m thinking once a month. I’ll let you know how it goes. Suzanne, monthly goals – what a terrific idea! I’m gonna have to steal that if you don’t mind. I think I’ve always admired people who set goals, but it seems that I’m more comfortable existing in the moment. Laurie, if I just existed in the moment I would never get anything done – but I appreciate those who can! Good post. Ever since I started my freelance writing business I’ve set one-, three-, and five-year business goals. In my one-year plan I also do mid-year reviews to make sure I’m still on-track, and the longer term goals get updated as life flexes to make for new opportunities and challenges. Because most of my pay comes from nonfiction, I also put money goals in place. I’ve found if I consistently budget future sales at at least 25% more than I “think” at first I can make (and what I need currently to make bills), I consistently reach that higher goal. I’ve only missed a couple of years, and even then I made at least half of the bonus percentage I was shooting toward. I think anytime you quantify goals, put a “true value” on your product, you’re much more likely to reach the goal. Brownie points are nice, but extra zeros on the paycheck are even better.